Every photo you take with FISHBUOY Mobile becomes a visual waypoint of your fish catches. Select an individual photo, find out the environmental conditions you encounter when you caught that fish. FISHBUOY Mobile is an essential tool that will help you capture and organize your fish catches digitally. Each photo is a "FISH" "BUOY" - a digital log of your fish catch with statistical and environmental data attached. This helps you to learn and plan for your next trip using physical information you already captured. Sometimes, you just want to take a photo of a sunset or other non-fish photos. 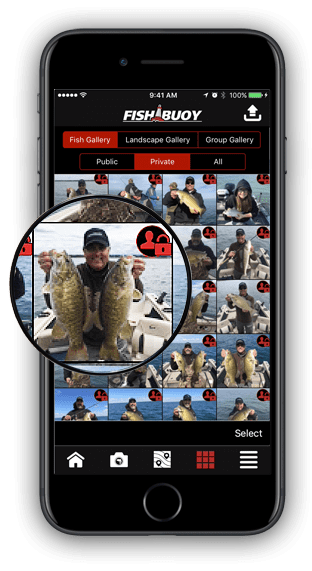 Switch to landscape view with simple swipe of the switch and take photos while you help rehabilitate a trout stream, participate at a fishing tournament, etc. Create private groups to share fishing spots with your closed circle of fishing friends. Create groups to help you organize your fishing history into locations or species. Whatever you decide, it is easy to add or remove people!